Included is a six-pack of three two-sided hits by Elvis Presley, who had 14 two-sided hits, more than any other artist in the 1950s and 1960s. (The Beatles were second with nine, and Rick Nelson had seven.) The Grooveyard Top Ten will feature the hits of April 7, 1962, and we’ll play your requests during the Grooveyard Party Hour. 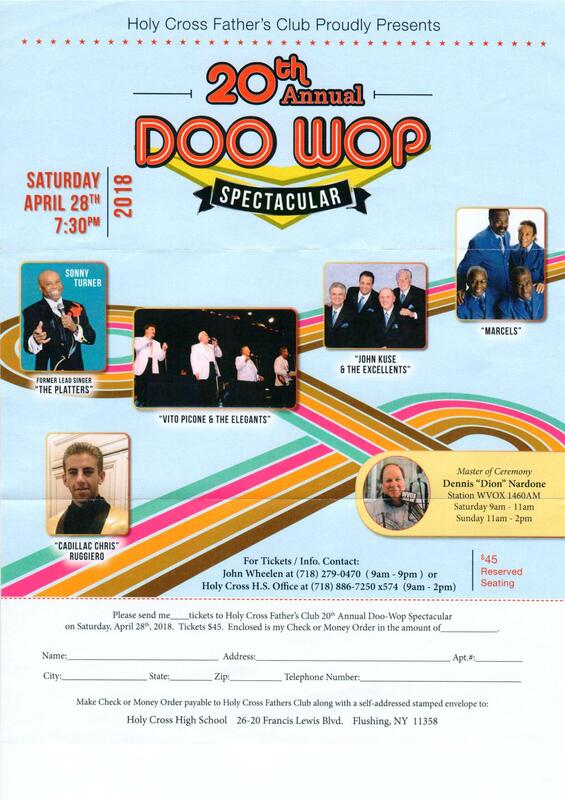 We’ll have another type of double play during the show, when we give away a pair of tickets to the 20th Anniversary Doo Wop Spectacular at Holy Cross High School. The April 28th show features Sonny Turner of the Platters, Vito Picone and the Elegants, John Kuse and the Excellents, The Marcels and “Cadillac Chris” Ruggiero. Tickets are available by calling John Whelan at 718-279-0470 or the Holy Cross High School Box Office at 718-886-7250 ext. 574.